Whether you still need some updo inspiration for an upcoming wedding or just can’t stop ogling over all the incredible braids you find on Pinterest (yeah, we can’t either! ), we’d suggest you take a look at Salma Hayek’s gorgeous braided updo at the premiere of her new movie, Grown Ups 2. The actress sported a simple texturized French twist with a little, well, twist to it. Adding two braids around the head created a halo effect with a Grecian feel, and the overall look feels like a revamp on the braid headband that so popular last year. To get the braided updo look yourself, attach a braid extension at the nape of the neck (it looks like Salma’s is actually a clip-in braid), or pull two small sections of hair at the nape. Braid each, pulling one over and across the twist while placing the other right above the hairline. 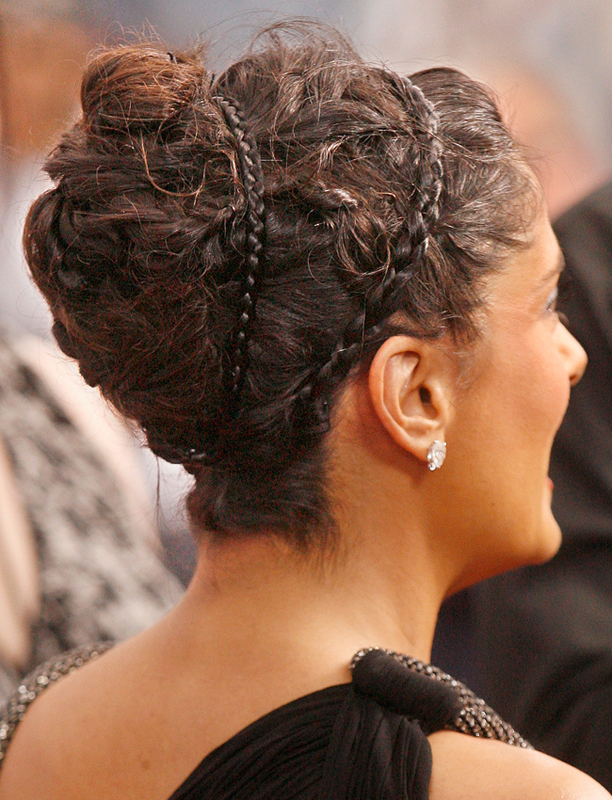 What do you think of Salma’s Grecian updo? This is seriously becoming our wedding hairstyle go-to!